3. Advertisement page is available. Interested may contact Admin at 8880207888 for placement of any advertisement.It's totally FREE!! MasterThejaswi Ram(s/o Mr.Sudarshana Bhat,Bajadka&Smt.Shreelatha,residing at Palakkad,Kerala(grandson of Bajadka Vishnu Bhat&Smt.Sunanda Amma.) 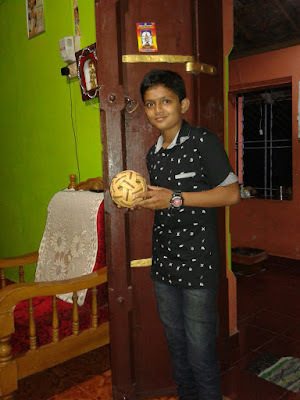 He is the captain of Kerala State Sepec Takraw Junior Team. Represented Kerala Sub Junior Tennicoit Team in the National Level Competitions. Contact No. No.09349876042(Sudarshana Bhat). The 4th meeting of the KarhadaBrahmanaParishath for the year 2016-17 was held on August 14, 2016 Sunday 11.30 a.m onwards in KaradaSamajaBhavana, Mangalore under the Chairmanship of Shri Balakrishna Bhat Kolikkaje, President. Totally 12 participants including KarhadaSamajaSudharakaSangha, Srinivaspura, Gundyadka (Banangady) with 5 office bearers and also Mangalore unit with 5 participants (including the President of the Parishath), Agalpady and Bangalore with 1 participant each took part in the deliberations actively (Balakrishna Bhat Kolikkaje, S V Bhat, Mahabala Bhat M, K Ramachandra Bhat Natekar, K Ganapathi Bhat, Mahadeva Bhat Kemaru, K Ramachandra Pandit, Sunil Kumar Angraje, Venkatesha Bhat Atikukke, K Vishwanath Bhat, M Purushotham Bhat, Ramakrishna Bhat K). KARHADA BRAHMANA PARISHATH Balakrishna Bhat Kolikkaje, President (Ph: 9448503090),” Surabhi”, Surathkal Post, MANGALURU - 575014. Office Address: Karada Samaja Bhavana (Near Vaidyanatheshwara Temple), SHAKTINAGAR Post, MANGALURU - 575016. Contact Address: Venkatesha Bhat Atikukke (9448996912),No.1/1-1, Shri Rameshwara Temple Road, 3rd Main, Chamarajpet, BENGALURU -18. THE 2ND MONTHLY MEETING FOR THE YEAR 2016-17 WILL BE HELD AT THE RESIDENCE OF SHRI. P. SURYANARAYANA BHAT (KEMMANABALLI) No. 36, AMARASONA APARTMENTS, 2ND CROSS, ADARSHA NAGAR, NAGARABAVI 2ND STAGE, BANGALORE – 72, ON 28TH DAY OF AUGUST 2016 (SUNDAY) EVENING 4 PM ONWARDS. ALL OUR COMMITTEE MEMBERS, ADVISORY COMMITTEE AND ALL ACTIVISTS / WELWISHERS ARE REQUESTED TO ATTEND. AGENDA PRAYER.WELCOME ADDRESS AND INTRODUCTORY SPEECH.REPORT ON THE FIRST MEETING 17/07/2016.A SHORT NOTE ON SRINGERI YATRA. - SRI GURUDARSHANA. (31.07.2016) SUNDAY AND RUGUPAKARMA (17.08.2016) WEDNESDAY.SAMAJOSTAVA - 18.09.2016 SUNDAY.FORMATION OF VARIOUS SUB COMMITTEES. ANY OTHER MATTER.PRESIDENT’S SPEECH. VOTE OF THANKS. Are we making effort to Breathe? Is Acupuncture scientifically accepted? - Part 13: Acupuncture Versus Allopathy (Modern Medicine). Part 10 - Acupuncture Versus Allopathy (Modern Medicine) - Is Modern Medicine scientifically advancing in a great way? Part 2 - What Happens When Medicines Are Given To Human Body? What happens when medicines are given to human body? What is basic life energy and what happens when it is exhausted? What is the cause of itching? - I have skin itching / allergy. How can I come out of this?